Bones gain most of their length via physes, also known as growth plates. If a growth plate closes prematurely, the bone and the limb may be significantly shorter than the opposite side. If a growth plate closes asymmetrically, meaning one side of it closes and the other side stays open, the bone will begin to curve, as the open side continues to grow, while the closed side restricts growth. For paired bones -- such as the radius and ulna in the antebrachium ("forearm," between the carpus/wrist and elbow) and the tibia and fibula in the crus (calf region, between the stifle/knee and hock/tarsus/ankle) -- if the growth plate on one bone is damaged, and the other bone's growth plate remains open, severe deformity can occur. Degenerative arthritis of the elbow and wrist due to abnormal weight-bearing and abnormal bone contact/rubbing. 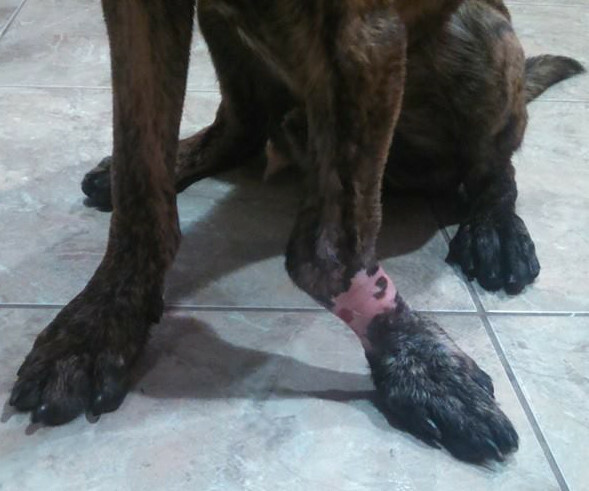 When/if identified soon after an injury in a young, growing pet, a relatively minor procedure can be performed in which the closed growth plate is surgically removed, eliminating its restrictive effects and allowing the radius to grow normally. If there is partial elbow dislocation present, a second cut in the ulna more close to the elbow can be performed to allow the elbow to reduce and prevent further distraction. 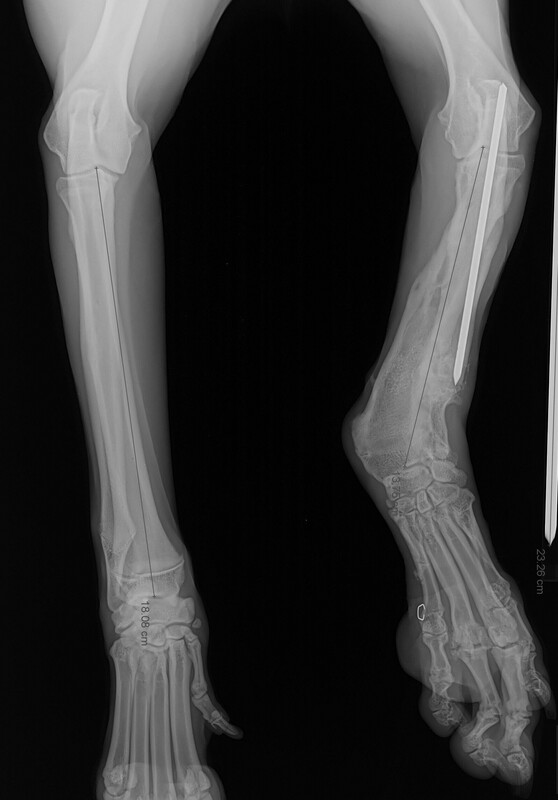 If sufficient angular deformity remains at maturity, a corrective procedure can be performed where the bones are cut at the point of greatest angulation/rotation, restored to normal alignment, and then stabilized with an external fixator (or a plate and screws). Once the bone is healed, the fixator can be removed. Additionally, if significant length deficit is present, a lengthening procedure can be performed. A circular external fixator, which uses a series of rings and smaller pins can incorporate a set of linear "motors," which allowed the bones to be slowly distracted. With appropriate timing and rate of distraction, the healing bone is stretched, but maintained in an early healing state, so that once the distraction stops, the bone swiftly and completely heals. Generally, with such motors, 1 mm of length can be gained each day. Significant length discrepancies can be recovered in this fashion, although in some cases tendon or nerve length will restrict growth, forcing us to stop the lengthening prior to complete recovery.